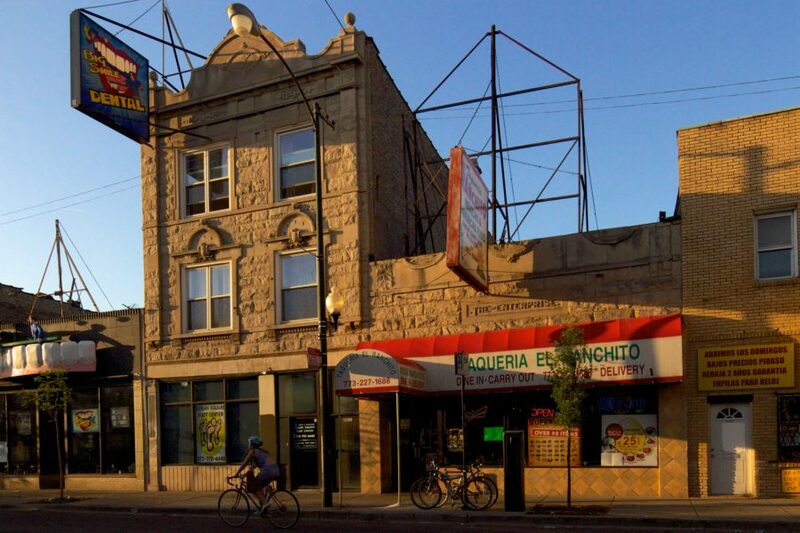 In a small taqueria at 2829 N. Milwaukee is a vestige of the cinematic era prior to the grand movie palaces of the 1920s. A small inscription of “The Enterprise” on the limestone facade is a clue to this overlooked landmark. Small movie houses showing silent moving pictures exploded in popularity around 1907. Prior to that, moving pictures were usually shown in vaudeville houses as a segue between live performances. These small venues typically sat around a hundred or so people, and charged a nickel for admission–hence the name nickelodeon. Similar to grand movie houses that came later, they often used incandescent lighting to illuminate the name of the theater on the facade. 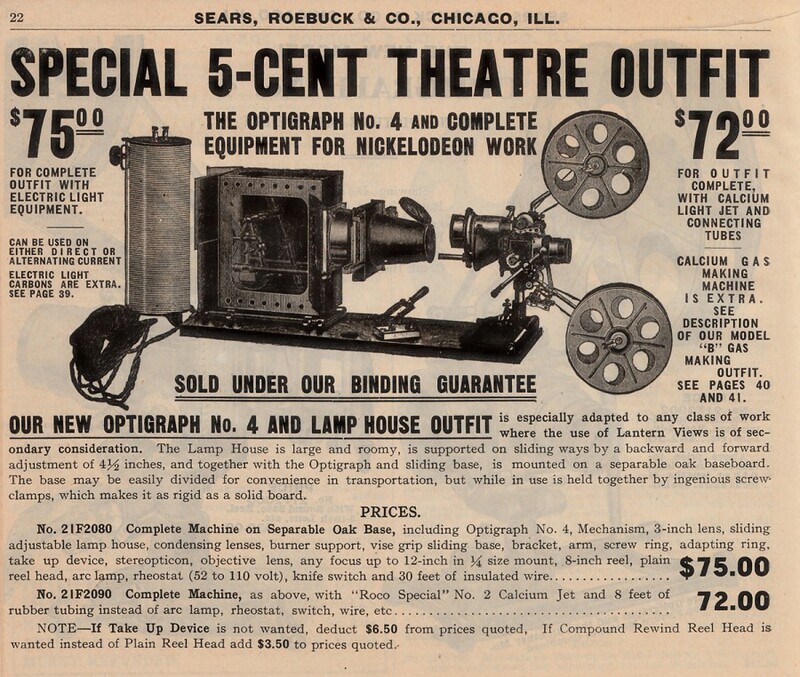 During the nickelodeon golden era (1905-1915), these storefront movie houses were in most neighborhoods, and their rapid spread left Chicago and other cities scrambling to adjust municipal laws to address them. 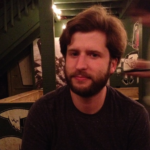 Hoyt’s account offers two critical insights for understanding film exhibition in Chicago. He finds that people began using the streetcar or elevated train to get to new retail blocks–which frequently contained a moving picture theater–rather than going to the Loop. Furthermore, Hoyt underlines the role of moving pictures in the growth of new communities, arguing that they were integral to the rise of new business districts. Together Burgess’s and Hoyt’s accounts point to elements of the pattern of film exhibition that might otherwise be obscured. Unlike many other nickelodeons, The Enterprise was built specifically to show movies, as evident on the facade. There is very little in the historic record of this storefront theater. 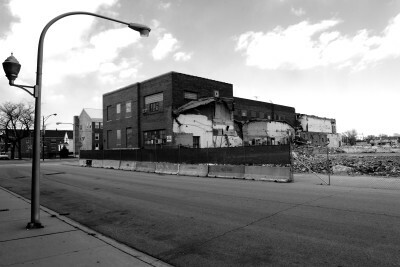 According to the Chicago History Museum database, a permit was issued for 2829 Milwaukee Avenue on June 8th, 1912, and the architect was “F. 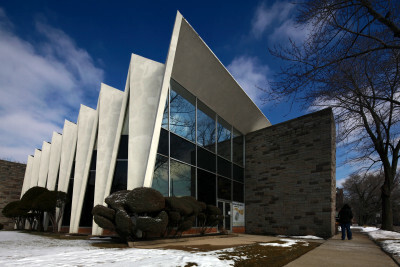 Lang.” This is a reference to prominent turn of the century Chicago architect Fritz Lang, who designed a number of West Side and Northwest Side houses and commercial buildings. He also designed a couple of Schiltz Tied Houses across the city. 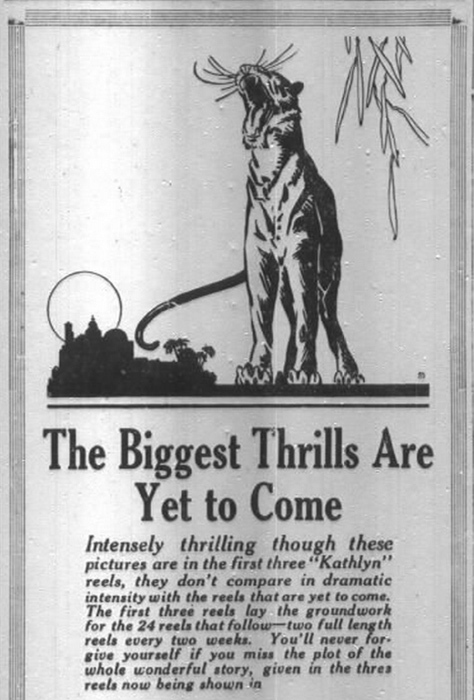 One of the films shown at The Enterprise was The Adventures of Kathlyn, an adventure series filmed in Chicago. The series was produced as a partnership between Selig Polyscope Corp and the Chicago Tribune. The Tribune saw a 10% increase in readership as a result of the tie-in. If the name Fritz Lang sounds familiar, it’s because it’s also the name of the filmmaker perhaps best known for Metropolis. Also coincidentally, the filmmaker’s father was an architect. The name of the theater shares something in common with a Chicago icon. The Enterprise Optical Company was founded by Alvah Roebuck, founder of Sears Roebuck. As far as I can tell, there is no link between Roebuck’s company and the nickelodeon which once operated on Milwaukee Avenue. The proprietor of The Enterprise acted quickly to capitalize on the new trend, but the nickelodeon faded from popularity almost as rapidly as it had gained it. 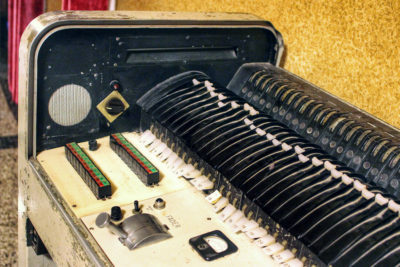 The last known record of The Enterprise in operation was 1914, and a year later Hollywood began the process of vertically integrating the filming, distribution, and ownership of movies. 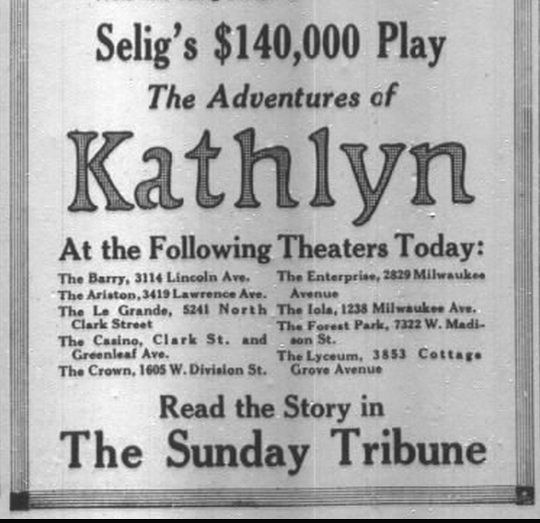 During World War I, major production companies collapsed, leaving neighborhood theaters without means of production and distribution. By 1915 most nickelodeons were erased from the urban landscape, replaced by opulent movie palaces. At an unknown date the top half of the building was demolished. If you look carefully at the limestone facade, you can see semi-circles where decorative elements once were. 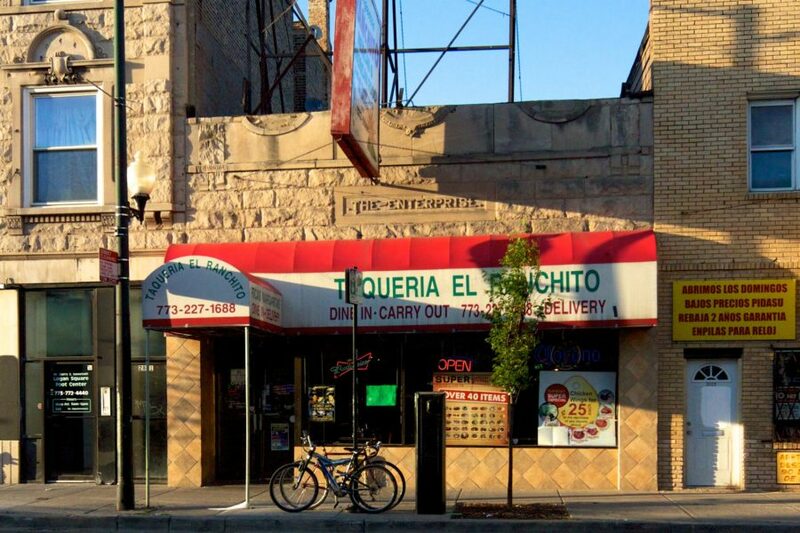 Today it is home to El Ranchito, a taqueria. 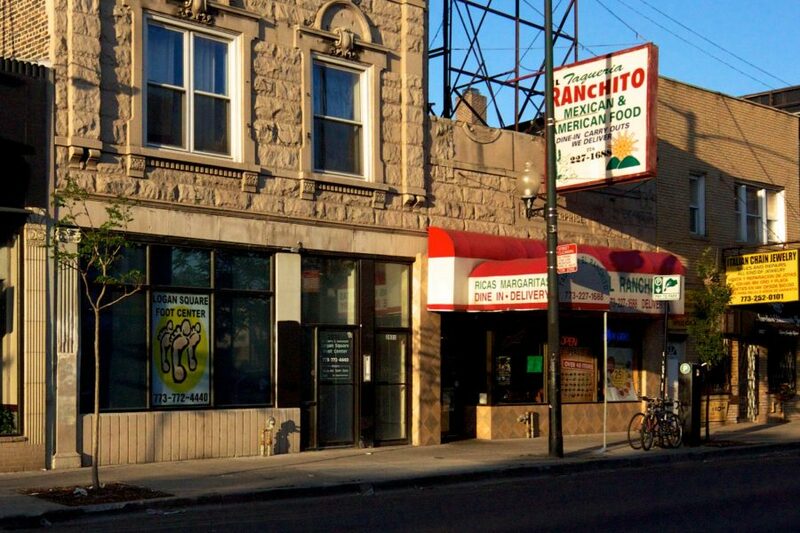 Stop in some time for some delicious Mexican food, and contemplate the cinematic history that once took place here.